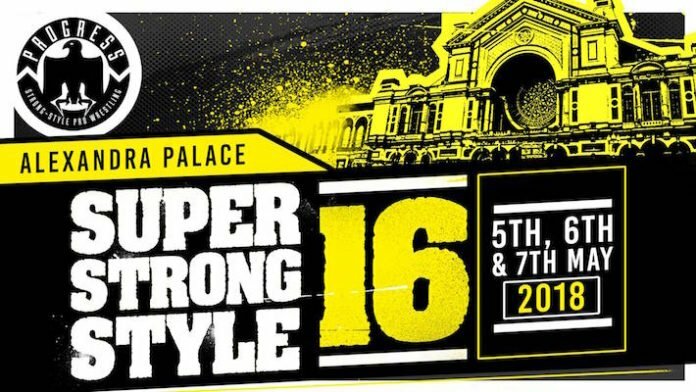 Following a night one filled with good matches, Super Strong Style 16 continues onto night two. We’ll set up the final four participants for night three, the women of PROGRESS are on the card, and we’ll see a highly anticipated PROGRESS World Championship match. Jim Smallman’s opening spiel saw him question the whereabouts of the fans who were there for night two but missed night one. Post-match, Tyler Bate ran out to save Pete Dunne. He threw shoes at the attackers. Post-match, Haskins got in Webster’s face, most likely for his unsure status with the team. Janela got on the microphone to challenge Havoc to a Death Match on night three, which would be a rematch from PROGRESS: New York. Super Strong Style 16 Quarterfinals: David Starr vs. Zack Sabre Jr.
Jim Smallman announced that the Wasteman Hangover Challenge returns on night three. Overall: 9/10. Night one was very good from top to bottom. Night two managed to improve on that. Again, nothing went under three stars and the show had a higher ceiling. WALTER/Banks was great outside of the finish, while Lee/Angelico was strong. Bate/Ohno and Sabre/Starr were among the best matches in PROGRESS all year long. A fantastic show that makes me feel good about what’s next for PROGRESS. I’m excited to see night three.